Artificial Intelligence, Machine learning, Deep Learning, Predictive Intelligence, all have become a buzzword in today’s scenario……..
AI has it’s diverse presence, be it Weather Forecasting, Google’s search predictions, Apple’s Siri for voice recognition etc. Desire to automate the tasks and remove human control as per one’s requirement has led to the urge of developing intelligent machines. Predictions hold that AI Driven technology would be the next big disrupter for enterprise software. SALESFORCE EINSTEIN TO SMARTEN UP SALESFORCE CRM !! 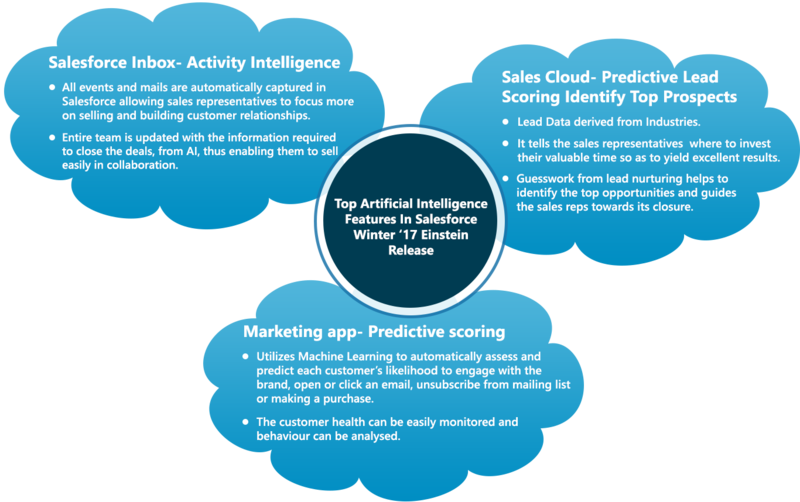 Salesforce Einstein an artificial intelligence (AI) is built into the core of the Salesforce Platform . It powers the world’s smartest Salesforce CRM. It has been implemented into several of the company’s existing cloud services: Sales Cloud, Service Cloud, Marketing Cloud, Analytics Cloud, App Cloud, Commerce Cloud, Community Cloud, and IoT Cloud. It delivers advanced AI capabilities to Sales, Service, and Marketing cloud. Anyone can build AI powered apps using simple clicks and code. Thus there would be the existence of Sales Cloud Einstein, a Service Cloud Einstein, a Marketing Cloud Einstein, an Analytics Cloud Einstein etc. Einstein AI tools are built in across various platform such as Commerce Cloud with product recommendations, Community Cloud with automated community case escalation and expert recommendation, Analytics Cloud with smarter data discovery. Powered by predictive analytics, advanced machine learning, deep learning, natural language processing and smart data discovery, Einstein’s models will be automatically customized for every single customer, and it will get smarter with every day to day interaction. Efforts are being made to explore the next generation of AI Technology and in our view its application in Salesforce would give Salesforce a competitive edge and the AI API’s could be exposed to enable customers to build applications on the Salesforce Platform. Dreamforce the must awaited Salesforce has much to unfold about Salesforce Einstein……. and ad to the Artificial Intelligence Revolution.